For harsher industrial chemical environments, you'll need extra-thick rubber gauntlets to protect your hands. The Konig Heavyweight Rubber Gauntlet is made of premium natural rubber in a thickness of 1.3mm for fantastic protection. Providing resistance against a variety of chemical hazards, the Konig Gauntlets are chlorinated to safeguard your hands against low-extractable proteins and residual chemicals. Despite the fact that they are heavy-duty industrial gauntlets, the Konig provide a high level of comfort. They are anatomically shaped to ensure comfort, flexibility and to reduce hand fatigue during prolonged periods of use. A naturally smooth, flock-free liner enables easy donning and removal. The Konig Heavyweight Rubber Gauntlets feature a rolled cuff. 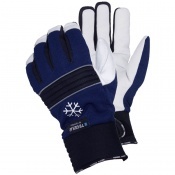 This offers drip protection, increased glove strength when donning and helps reduce roll-down. The Konig Heavyweight Rubber Gauntlet is available in three different sizes. Please consult the table below for details and select the appropriate size for you from the drop-down menu above. The Konig Heavyweight Rubber Gauntlet is also available in a choice of either 44cm or 60cm cuff lengths.